This Advent season seems to be more anxious than any other I can remember and I am finding my devotional readings helpful in focusing on things above. Henri Nouwen's approach to being quiet in the midst of chaos provides a true Christocentric moment. 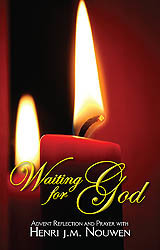 I thought you might find this devotional booklet an aid to your ministry. May you have the peace that passes all understanding this Advent and always.